Ever since I made those first loaves of whole wheat bread for Zorra's World Bread Day event last October, I have been making it on a regular basis, and if I do say so myself I have pretty much perfected it. My goal was to make it often enough that I no longer had to refer to the recipe, and I achieved that goal a few months ago. And I have succeeded beyond my wildest dreams. The first loaves tasted good to me because I had made them, but they didn't seem like real bread to me compared to the whole wheat bread I was bringing home from the grocery store. There was something a little off with the texture, and it was a little more dense even than I like, and I like dense bread. There were some other problems as well. The recipe I was using made two loaves of bread, and I was starting to drown in bread. I froze some and gave some away, but still there was more. Luckily, I discovered that homemade bread does not get moldy, it just gets stale. Which was odd to me at first when I considered that processed bread has all of those preservatives to keep it fresh, but it will often turn moldy within a week. My unproven hypothesis is this: preservatives help keep the bread first-day-out-of-the-oven soft, but they do not actually keep the bread fresh. Without the preservatives, the bread starts to dry out after the first day and just keeps getting more and more stale, but it does not actually go bad. And this is where toast, bread pudding, and french toast came into being. They offered a tasty means by which to finish off those last stale hard bits of leftover bread. Another problem was that two loaves of bread use a whole lot of flour, and it takes a lot of elbow grease to mix and knead that much flour. But after I figured out how to half the recipe so I could experiment with yellow pistachio whole wheat bread for Bread Baking Day 14, I realized that I could just make one loaf at a time and life has gotten a whole lot easier. One loaf easily lasts me through the work week, and then I have the last little leftover bits with which to experiment. And it takes much less work to knead four or so cups of flour than it does to knead eight cups. It now takes about as much effort to bake my weekly loaf of bread as it does to do my weekly laundry. That is to say, it keeps me close to home for a few hours, but it doesn't really take all that much work. It's become my Sunday routine. I mix up the sponge, set it in the oven for the first rise, then call my sister for a long chat, during which I will add the flour and knead it, let it rise, then bake it. And there's nothing like a slice of fresh-out-of-the-oven (for real, not preservative-induced) bread slathered with butter. Yum. I didn't include the recipe for my World Bread Day post because I thought (and still think) that anyone who wants to learn how to bake bread should get a copy of The Tassajara Bread Book. I am posting my one-loaf version in the hopes that it might inspire anyone who has always wanted to make their own bread but is afraid to try. 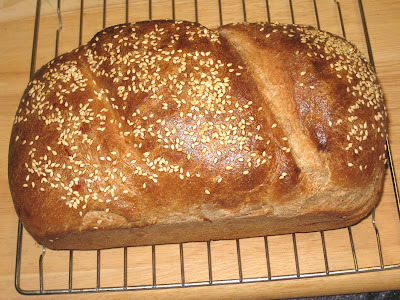 The final perfecting touch was when I bought some sesame seeds and started sprinkling them over the top of the loaf. Makes all the difference in the world. All of these instructions are intended to be used as guidelines rather than strict Instructions. It will not make that much difference if you don't let the dough rise exactly one hour. or if you add more or less honey, oil, or salt. After you have made it once, you will get the idea and can make the technique your own. Place the 1-1/2 cups whole wheat and the 1/2 cup whole wheat white flour in a bowl and mix together. Place lukewarm water in a large bowl. Add yeast and stir with a wooden spoon until the yeast dissolves. It may not seem like the yeast is going to dissolve, but be patient and keep stirring gently and eventually it will dissolve into the water. Add honey and stir until it has also dissolved. Add the flour, 1/2-cup at a time, and vigorously stir it in. You will end up with a thick, muddy consistency. This is called the sponge. With the wooden spoon, beat the mixture for 100 strokes. Cover with a damp cloth and set it in a warm place to rise for an hour. I use the oven (but I do not turn it on). After an hour, take the sponge out of the oven. Add the oil and the salt and fold the mixture with the wooden spoon until it has incorporated into the sponge. Add the flour, incorporating it 1/2 cup at a time, until you can't add any more. This may or may not take all of the flour; most likely you will have some left over. Spread some over a clean, dry counter and empty out the dough onto the floured surface. Knead the bread by folding it over towards you, then pushing it away with your palms. Turn it one quarter and repeat. Add flour as needed to keep it from sticking, until you can knead the bread without needing to add any flour. Form it into a ball. Pour a little olive oil into the bread bowl and put the dough into the bowl top-side down to cover it, then turn it over so the whole ball has a covering of oil (to keep it from drying out as it rises). Cover with the damp cloth, set it back in the warm place and let it rise for an hour. Punch it down with your fist (about fifteen times), then cover it again and let it rise for another hour. Remove from the oven and punch it down again. Remove the dough from the bowl and form a ball. Cover with the towel and let it rest for five minutes. Turn on the oven and set it to 350 deg. F. Grease a bread pan. Knead the dough about six strokes or so, then lay it out on the counter. Starting with the narrow end, roll it into a loaf. Put it in the loaf pan, top side down, and press the seamed ends together. Turn it over, press it flat with the front of your fingers laid flat, cover it with the damp towel and let it rise for 25 minutes or so. Beat the egg with the milk. With a sharp knife, cut two diagonal strips on top of the loaf. Brush with the egg, then sprinkle the sesame seeds liberally over the egg. Bake for one hour, or until golden brown and the loaf sounds hollow when you tap it. Remove from the oven and take out of the pan. Let cool at least one hour before slicing (if you can stand to wait that long).